I was still on the quest for a great breakfast pizza. This time, I decided to hard boil the egg and feature the sausage and cheese with the seasoning of an everything bagel. Bagel pizzas would actually be great for this! I’ve made a few breakfast pizzas, but today’s might be the best. I made this one way back when with eggs dropped on top. I made this one with a hashbrown crust. I made this one with scrambled eggs. Pan fry the sausage links until cooked through. Drain, then slice into 3-4 pieces per link. 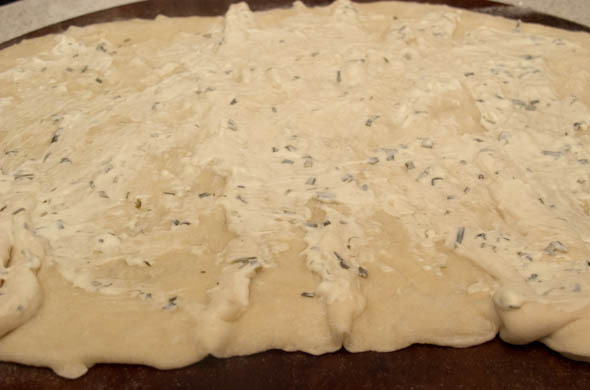 Roll out pizza dough with a little flour until 1/4 inch thick. Spread cream cheese on top. 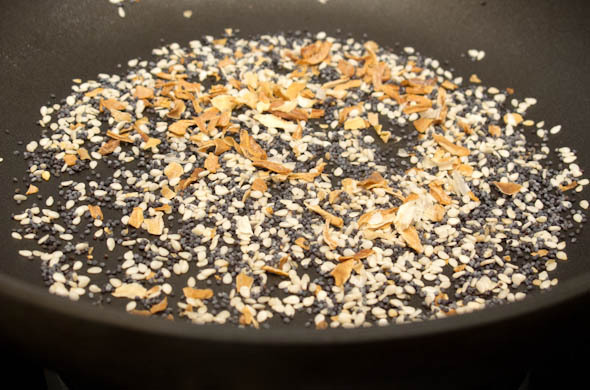 In a dry, flat pan, toast the spices over medium heat for 3-5 minutes. 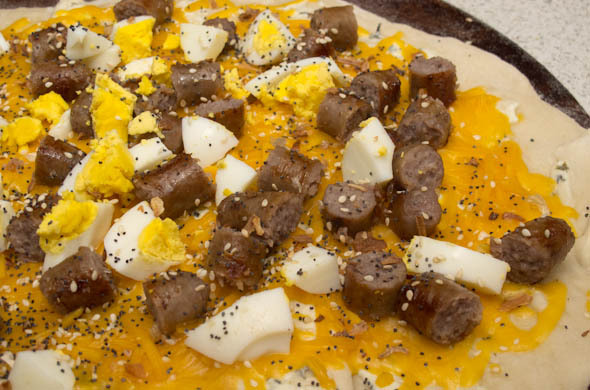 Top with cheese, sausage, chopped hard boiled eggs, and toasted spices. Bake for 10-15 minutes until the cheese is melted and the thin crust is crisp. Top with chopped chives or green onions. I loved this one. I hadn’t done a crust this thin before but this was thanks to Mr. J to roll it out while I prepped the toppings. It was nice to have the cracker thin crunch to keep it a bit lighter. I used half the dough I normally use. Instead of sauce I used just a touch of cream cheese. 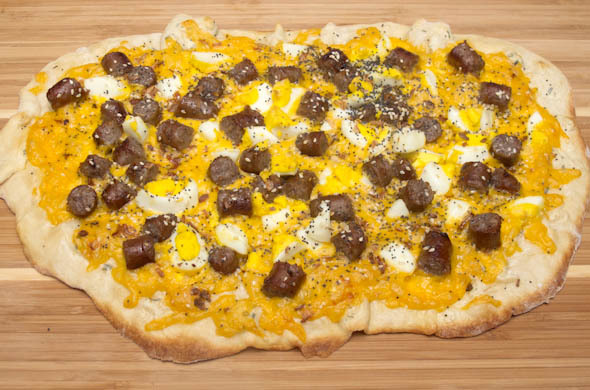 Breakfast pizza is one of my favorite things on Earth and I LOVE that this has hardboiled eggs on it. Perfect any time of the day! This is so fun! Love that you everything bagel-ed the pizza! 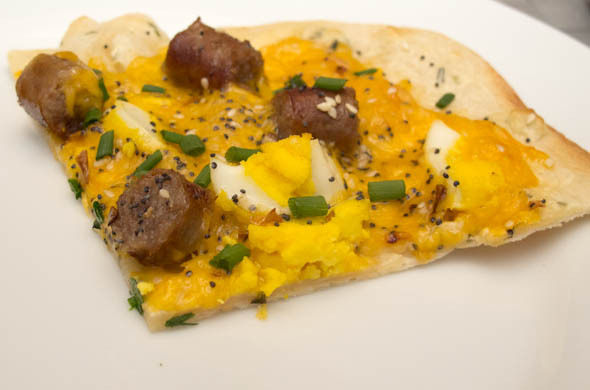 Wow…This breakfast flatbread with everything bagel spices looks like the pizza! I need to add bell pepper to the recipe, and it would be perfect. Thx, Emily for sharing!